Would you like to try your data science skills? In SIGNATE, data scientists compete each other to produce the best models. Making your profile informative by adding a biography, linking your social media accounts as such. Receive information about data science job opportunities and get connected with head hunters. 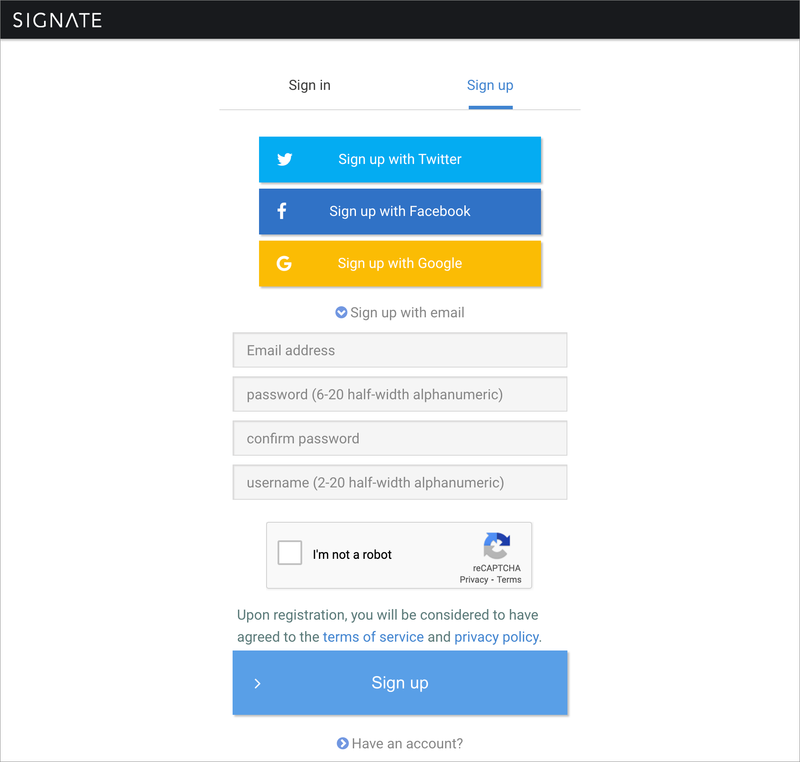 If you would like to use SIGNATE for educational purposes at universities and companies, please contact us. 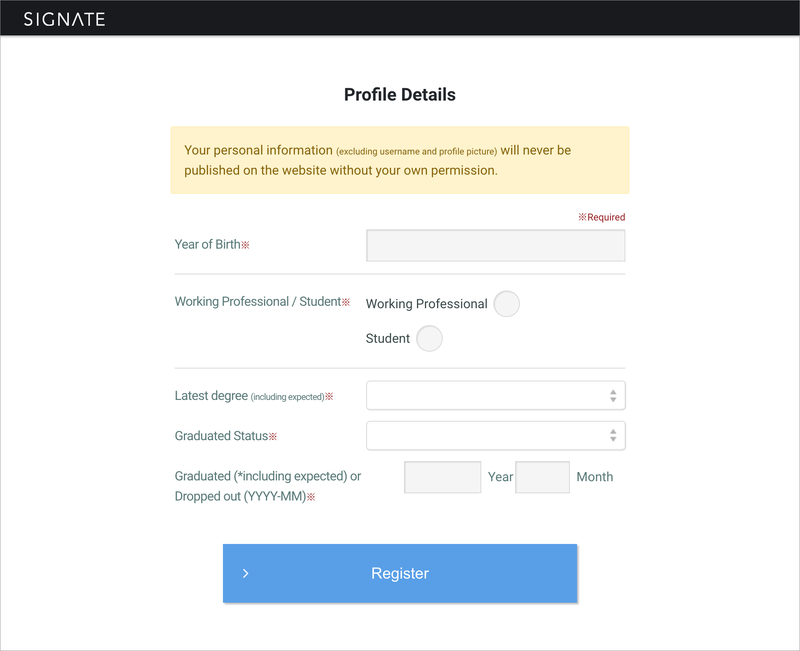 Fill in the required fields on temporary registration information input screen. Input username with 2 to 20 characters. Input password with 6 to 20 alphanumeric characters. Click the link in the confirmation email which you will receive after filling in the required fields in . Please note that you will need to register again unless you click the link which expires in 24 hours. 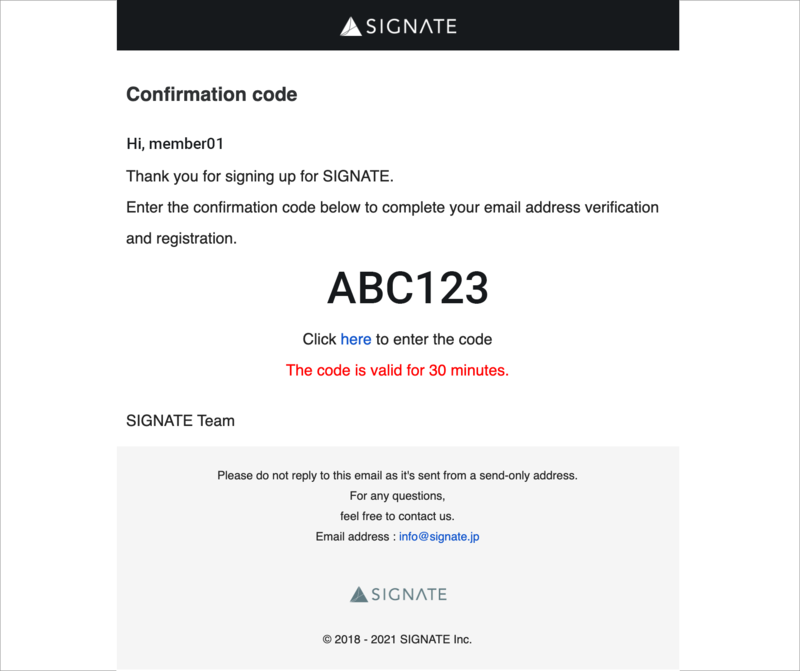 If by any chance you don't receive the confirmation email, please contact us from here. Click the link in the confirmation email and fill in the required fields to complete registration. Date of birth is required when you forget your password. Let's participate in the competition! Anyone can participate in the competition, which is for the purpose of solving the problems of companies and the government. As one of participants, compete against each other to produce the best models and win a prize! Limited participation competition where those with excellent track records in SIGNATE can only participate. Participants conclude the NDA contract and analysis in the cloud environment. Smaller number of participants in the competition whose prize money is higher than usual! Competition for the purpose of research with a focus on universities and public research institutions. You can challenge on the cutting edge themes that tickle the intellectual curiosity. It may bring opportunities of joint-research and papers! Start here! Gain practical experience through practice competitions in various fields. In the Learning page, we also offer educational materials to learn programming, data preprocessing and modeling skills. You can choose any competitions that are likely to suit your skills and interests! 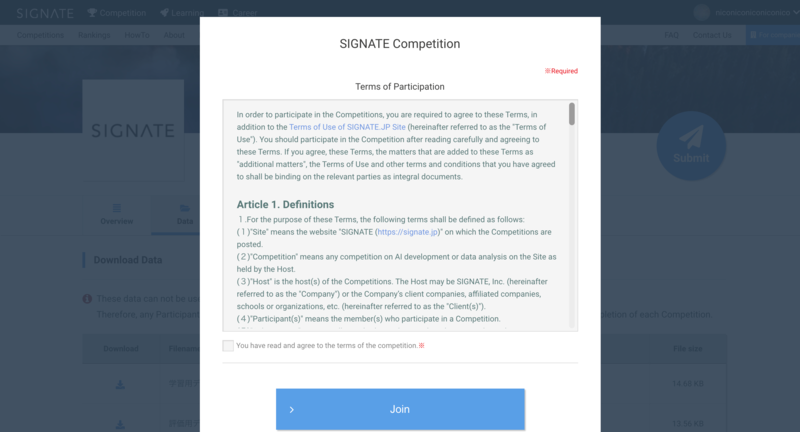 When you try to download data for the first time in a competition, the terms of the competition will be displayed. Please read through and agree to the terms. You must agree to the terms of each competition to participate in it. There are some competitions that require a conclusion of NDA contract and identity verification. If you have any questions about data and terms of the competition after taking a look at overview of dataset, please contact us. Please do not use the dataset for any purpose other than the competition and redistributing data is prohibited. 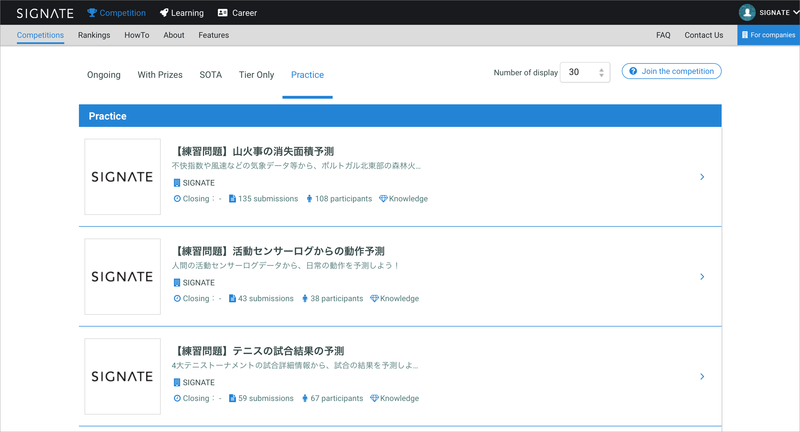 There are some competitions where cloud data analysis environment is provided, which means participants cannot download dataset to their local environment. Explore data and create a best predictive model! Please read through the competition rules so that your model won't violate them. Click here to see an example of the competition rules. For any questions about the rules, please contact us. It would be helpful to reproduce the result when you become a preliminary winner. As there's a chance to win due to disqualification as such, don't be discouraged with bad scores! Overfitting happens when a model learns the detail and noise in the training data to the extent that it negatively impacts its performance on new data, which results in a drop in the final ranking. Please keep in mind to create a practical model as each competition has its own goal such as achieving business challenges, solving social problems, and sharing results of studies. Once you have downloaded dataset, get started with figuring out the characteristics of the data. It is important to confirm the number of records in data, category of data (continuous, discrete, string), percentage of missing data, distribution of data, and task type (regression, classification, multi-class, multi-label). After figuring out the characteristics of the data, it's time to start exploratory data analysis. It is good to analyze to find such as the relationship between the variables, which variables are closely related with the objective variable, and what kind of features seems to be created to gain insight for prediction accuracy improvement, by using the methods like clustering, correlation analysis, and other various approaches. Once the exploratory data analysis is done, let's move on to the next step: feature engineering and creating a model. Evaluate your prediction accuracy based on the data used to train your model to estimate how good prediction it gives. Then submit the prediction on the test set to SIGNATE to see how it actually performs. Keep engineering features that are likely to contribute to your model improvement and submit the prediction to confirm whether it works or not. 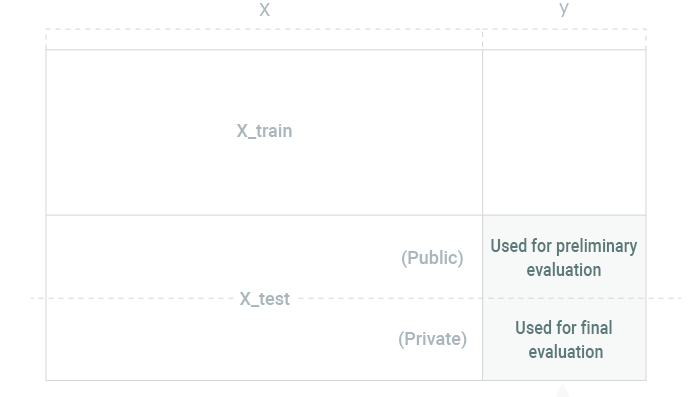 Make good use of techniques such as cross validation, bootstrapping, feature selection, and hyper parameters tuning to avoid overfitting. Don't forget to manage your analysis results so that you can reproduce them later. How good is your model? See how it performs! It's good to see how good other competitors models are and compare with yours. As the competition end date approaches, more and more submissions are made and the competition tends to become hot and intense. Keep improving your model so you can maintain your ranking. Every competition has a limit to the number of submissions per day. Once you have reached the limit of the day, give your brain and machine a break and let's wait for the limit getting reset at 0:00. The test set is split into a public and private part in the competition. During the competition, scores on the leaderboard are computed based solely on a fraction of the test set. We use the rest of the set to evaluate and determine the final ranking after the competition. Leaderboard automatically switches to the final evaluation the moment competition ends, where we sometimes see the leaderboard ranking shaken up. 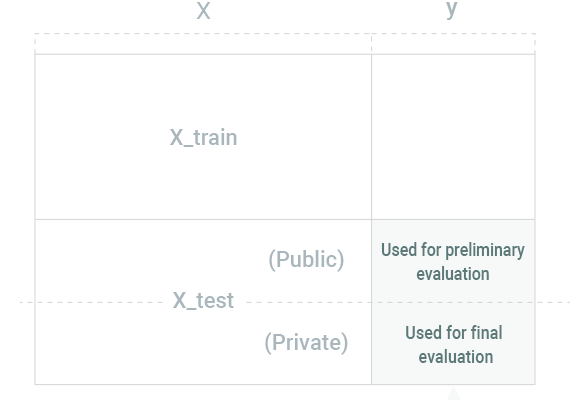 Submit predictions on the test set which should be made in the specified format by your trained model. The purpose of the competition for the participants is to produce the model that predicts best on the test set whose objective variable is disclosed. * Trying to figure out the true value of objective variables on the test set is regarded as cheating which is prohibited. When a participant is found to have cheated in the competition, he or she will be disqualified. Submission score is automatically computed based on the evaluation criteria to be reported on the leaderboard along with its ranking. Scores reported on the leaderboard during the competition are temporary ones and after the competition, they will be switched into final evaluation ones. The leaderboard will be switched to display the final ranking once the competition is closed. Iterate step 3 and 4 to improve your score. Get your model verified to claim the prize! Preliminary winners are required to provide their code and documentation. Please make sure that your model can reproduce the final ranking score and does not violate the competition rules. The documentation should be well written and polished. Preliminary winners are required to submit source code and documentation of their model to receive the prize money. Please see the guidelines below for further details. In order to receive the prize money, the intellectual property rights in your model are required to be transferred to the competition sponsor. Please note that use of the model and publishing its approach in the blog is not allowed once the rights are transferred. If you have any questions, please contact us. We will send a notification email to preliminary competition winners. We will notify in a week after determining their final ranking. Please check your spam folder if the email is not sent to your inbox. Following our team's instruction, submit your model documentation by the deadline. We would appreciate it if you could provide us with well-arranged code and document as it helps us to proceed the verification process smoothly. Please make sure that your submitting model is what you used to generate the final evaluation result. After we receive your model submission, we will confirm whether the model violates the competition rules and can reproduce its final evaluation result. Please note that our team will contact you when in unexpected situations during the model verifying process. To proceed the process smoothly, please provide your model documentation in as much detail as possible. Almost done! By concluding a contract of such as transferring rights, you will acquire the right to accept the payment of the prize. After entering into this agreement, in principle, the payment of the prize money will be completed within 2 months.